Dell is used to disappointment. Ever since her dad left, it’s been one letdown after another. But no one—not even her best friend—understands all the pain she’s going through. So Dell hides behind self-deprecating jokes and forced smiles. K. M. Walton is the author of Cracked and Empty. A former middle school language arts teacher and teaching coach, she is passionate about education and ending peer bullying. She lives in Pennsylvania with her family. Visit her online at KMWalton.com and follow her on Twitter at @KMWalton1. "Bullying has become a hot topic in YA lit, and Walton offers a sensitive portrayal. Recommend to parents as well as their teens for facilitating self-examination and open lines of communication." 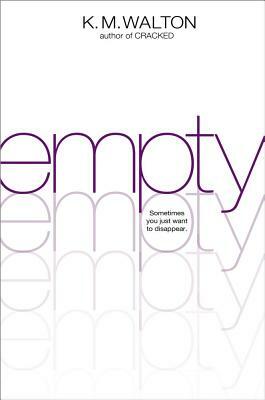 "Empty will hit home hard with teens who have been or are being tormented and should shed some light on how painful and destructive bullying is to its victims."